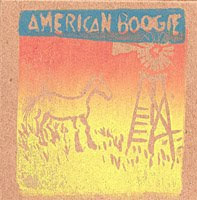 “American Boogie” by Michael Hurley, co-edited & produced by Jeffrey Bowers, was video taped by Michael Hurley during a tour of musical gigs in ’08 with musicians Amy Annelle & Ralph White. It begins in Lawrence, Kansas & goes to Whitefish, Montana and ends with a train trip to Portland, Oregon. David Lightbourne, blues musician & professor, and the author Joe Carducci are host to the travelers at intervals & David pontificates on the blues & gospel.